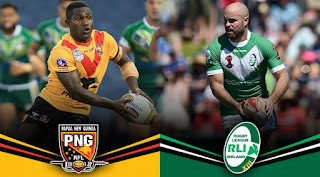 The Rugby League World Cup Pool C match between Papua New Guinea Kumuls and Ireland will be played at the National Football Stadium in Port Moresby today. Only one team from the Group C progresses to the finals. Both the Kumuls and Ireland a locked at 2 points apiece after their wins over Wales and Italy last weekend respectively. The winner of this match will progress to the quarter-final play off. It is do-or-die game for the two teams. We will bring live tweeter feeds from the Stadium as the game progresses. We will also post live videos. Refresh every time to see the game updates below.